Hurricane Katrina devastated New Orleans in 2005 with sustained winds of 100-140 mph and storm surges as high as 29 1/2 feet. By the time the storm ended, 80 percent of the city was underwater. Twelve years later, they’re still rebuilding – and masonry is proving to be the product of choice. He adds that there have been fundamental shifts in the city’s economy and population. Buildings, too, are on the rise — literally. The first usable floor is elevated well above ground level. Rome adds this concept isn’t entirely new in the region, referencing Antebellum homes that were elevated in anticipation of occasional flooding. “Masonry is just a good material to use where there’s the potential for water. Most masonry structures are going to survive a flood,” Rome says. He points to Saint Joseph Abbey and Seminary College, which was inundated with nearly two feet of water in March, 2016. While there was $30 million in damage, the masonry structures themselves were not destroyed. Masonry veneers also offer flood resistance, adds Rome. 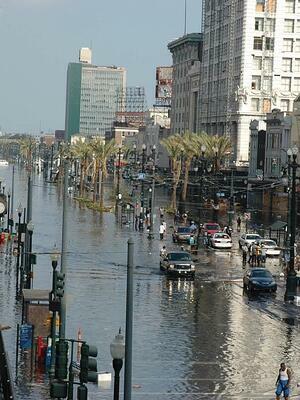 The lessons learned in New Orleans in the more than a decade since Katrina are a moral for other parts of the country. “We learned many lessons about the resistance of water and wind. The code in New Orleans now balances the potential for disaster with the reality of the construction industry,” Rome says. South Plaquemines Parish, surrounded by water on three sides, encompasses the peninsula of Louisiana at the mouth of the Mississippi River. The 26-foot tidal surge from Hurricane Katrina topped the levees both on the river and gulf sides of the parish, completely submerging it for weeks in murky water mixed with oil and chemicals spilled from nearby refineries, riverboats and tankers. 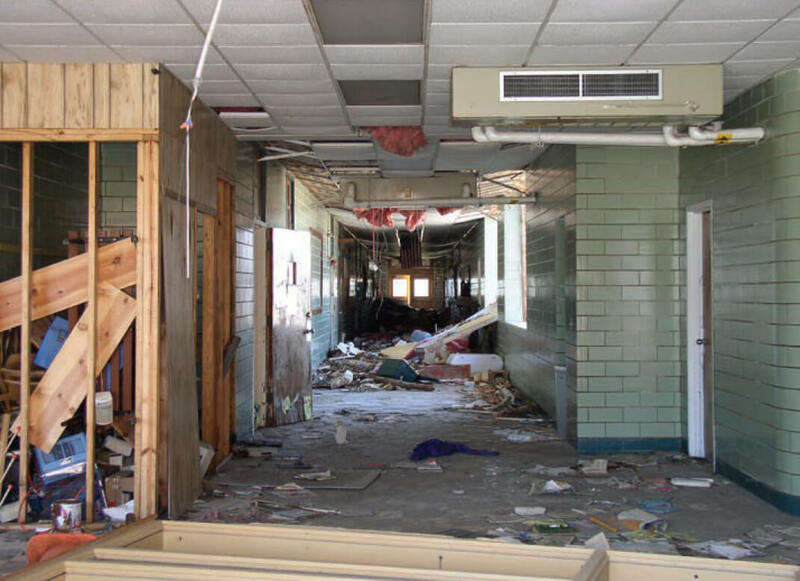 Every school in South Plaquemines was destroyed. Due to mass exodus of the population following the storm, the Plaquemines Parish School Board decided to consolidate the school system of the entire lower parish, combining the schools of three communities into one. 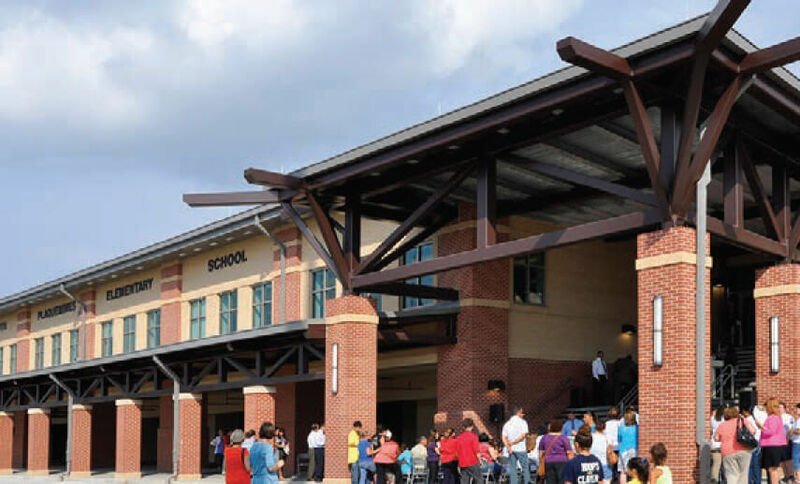 Verges Rome Architects was tasked with designing the new South Plaquemines Elementary. The $30.9 million project was funded by FEMA and designed to comply with the agency’s strict mitigation requirements. The school opened its doors to students and their families, faculty and staff, in time for the 2014-2015 school year. Serving 870 students in prekindergarten through sixth grade, the 105,054 square-foot, two-level structure is raised 18 feet above grade to mitigate future flooding from a surge of the Gulf of Mexico. The building’s ground level comprises a covered outdoor play and parking area, rather than occupied areas, so it can be a total wash-through in the event of a flood. Verges Rome incorporated columned arcades along both sides of the building at ground level, to visually lessen the void created by the building’s high elevation. The design also separated public spaces from offices and classroom for security and convenience. On one side of the school, there is visitor access for events in the gym, library/media center. The common spaces maximized use of the areas while allowing light into the building. A partitioned stage between the gym and cafeteria allows for either simultaneous events in both spaces or use as one large performance stage. The cafeteria itself is an open, two-story space with design elements such as clerestory windows and a glass interior facade that allow the flow of light deep into the building. On the opposite side of the public access is the bus loading zone and entry to the school’s second floor via either stairs or ramp. Students in pre-K through second grade take classes on the second level, while those in grades three through six attend class on the third level. Stairwells are strategically placed to direct student traffic flow away from classrooms for minimal noise infiltration. 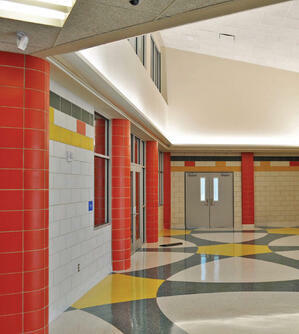 Echelon’s Trendstone Plus® was used on the school’s interior. “We chose it because it provided the aesthetic we wanted, is low-maintenance and durable,” Rome says. Architect Peter Fortier, AIA, EDAC of LACHIN Architects, APC in New Orleans has served on design teams for some of the more notable projects in the city of New Orleans. When designing a new school in Saint Bernard Parish, however, Fortier was faced with a compressed construction schedule, on a site still at risk from future flooding. The resulting school came in on time, on budget, and ready to educate young minds — as well as to withstand another Katrina if necessary. "When we first surveyed the post-Katrina damage, we took note of construction materials that survived. Glazed concrete block and glazed tile best weathered the inundation and could be cleaned and reused,” Peter says. Mason Randy Rush, of Rush Masonry in New Orleans, agrees that masonry buildings fared better in Katrina than those constructed with other building materials, and has seen increased use of masonry since 2005. “Since Katrina, we’ve been seeing a lot more glazed CMU, groundface CMU, and interior CMU partitions because the materials are better able to withstand flooding and are easier to cleanup afterwards,” he says. “With the glazed masonry wall, the elevated slab, and the raised mechanical systems, we can weather another Katrina. Once waters recede, we’ll be able to hose everything down and have everything back in working condition quickly,” explains Fortier. Although a typical schedule for a school of this size would be 15 months, this project was completed in 12 months without incurring serious overages or overtime charges. Of course, the compressed schedule created a cost-control challenge. Using glazed masonry was one of the value-engineering methods he used. Rush Masonry, working with Gibbs Construction, did an outstanding job of scheduling and installing the work to accommodate the demanding schedule. For aesthetics and practicality, he established a multi-color palette, with a separate color theme created for each wing. 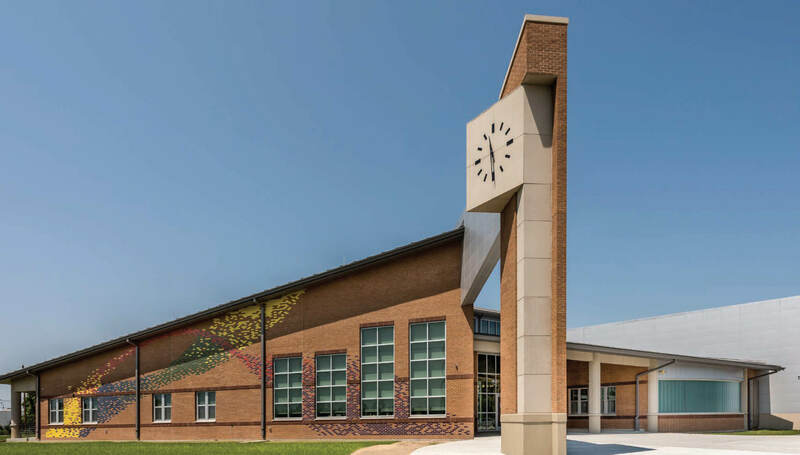 “Color-coding is a better way to help K-5 students identify the different areas of the school than signage, which is another benefit of glazed masonry,” he explains. Colored terrazzo flooring and trim coordinates with the color themes of the wings, and hexagonal designs tie in with the school mascot, the bee. “The finished look of the design exceeded my expectations,” Fortier notes. Arlene Meraux Elementary opened its doors to nearly 550 students in August, in time for the 2017-2018 school year. The 115,000 square feet, newly built, state-of-the-art facility features two courtyards, a large playground, an outdoor classroom, library, gym, music, and art classrooms. The school sits on a 14.6-acre plot of land donated by The Arlene and Joseph Meraux Charitable Foundation. Since Joseph Meraux had owned one of the largest collections of rare and novel clocks in the world, the school design includes a clock tower as a nod to this collection. “Wherever there was new construction, we utilized glazed CMU, and all but one used Astra-Glaze. I’ve been very happy with the product," Fortier says. "I primarily use it on the interior because it performs well. I also sometimes use it on the exterior as an accent to brick." While we certainly hope that these disaster mitigations don't prove to be necessary in the years to come, there's no way to know what the Gulf of Mexico will throw at New Orleans in the future. We're confident that by rebuilding with these lessons in mind, many structures, homes, and schools won't be devastated by flooding to the same degree as they were in 2005. As you make product selections for your construction projects, we encourage you to keep disaster preparedness and product longevity in mind. There are a variety of building components that can help protect against a hurricane and the forces that come with it.